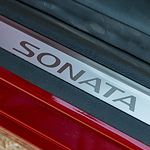 The Hyundai Sonata offers the SE, SEL, Sport, Limited, and the Limited 2.0T. Each has features that come standard. As you climb to the higher trim levels, more features are standard. You can also add functions by choosing from different packages, including the Tech Package and Ultimate Package. Lane Keep Assist, rear parking sensors, an 8-inch navigation screen, and smartphone compatibility are just some of the features to look forward to. If a premium engine is important, you may also want to look at the Sonata Limited 2.0T, which is the only one to have a turbo engine with more horsepower.